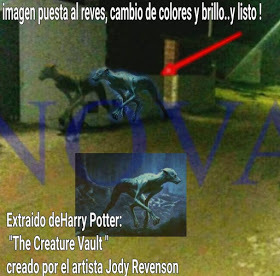 The photograph, taken and night and somewhat blurry, has already made the rounds of social media to warn against the possible danger. 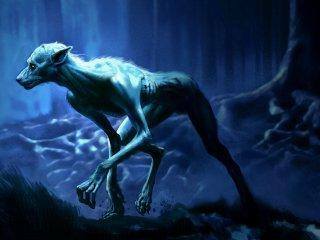 An audio broadcast expains that the beast squared ofrf against a Pitbull and a German Shepherd who lost the encounter and died. The creature subsequently vanished. The image accompanying this article is used on others reporting similar situations that occurred elsewhere and must be taken with considerable skepticism. 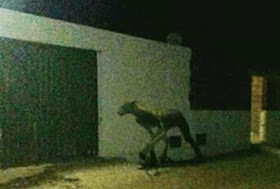 The 6 April 2018 issue of El Tribuno de Tucumán reports "Strange creature killed two dogs and terrified residents of Totoras (Santa Fe)", adding: "A creature with terrifying features threatens residents of Totoras. A local resident states taht the beast fought with two dogs (a Pitbull and a German Shepherd) killing both of them. La Gazeta do Cariri in the Brazilian state of Ceará for 04/2018 reportes "Alleged apparition of the Lobisomem in Exu-PE - terrifies local residents." This arises from the same initial broadcasting of the image that has occurred through Whatsapp. 04/09/2018 - Publication of this story on our Facebook page yielded an interesting crop of contributions, among which those from Ariel Maderna, Luis Jorge Salinas, Dendro Irime Cydar and Cristian Vera Duarte stand out. 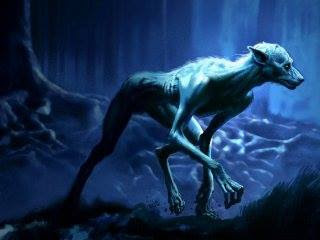 Dentro Irime Cydar noticed that the image matches that of a character appearing in the book Harry Potter and the Prisoner of Azkaban by J.K. Rowling named Remus Lupin, showing him in his werewolf shape in the forbidden forest [https://www.pottermore.com/image/lupin-unbound]. As Dendro Irime Cydar points out, the image could have been modified (Photoshopped). Christan Vera Duarte shared the following image which affords a better view of the photo montage. Our thanks to our friends for making us aware of the media hoax involved!